The holiday house is over an hill with olives threes all around and wood. A great panorama on the Val di Cecina valley, Siena’s land, Colline Metallifere. The House was built in keeping with its historical value. The house was, in fact, a place sacred to the Etruscans, was a former princely residence thanks to a panoramic position. The residence has 16 accommodations and is located within a park of 6 hectares. The apartments are all in Tuscan style, with simple furnishings and essential. The complex has a large garden of about 10,000 sqm, Restaurant with veranda, swimming pool (12×6 m, open from May to September), tennis court (concrete), common room with fireplace and air toys. The pool is surrounded by garden and a forest of oak trees with tables and chairs, where cool down on hot summer days. 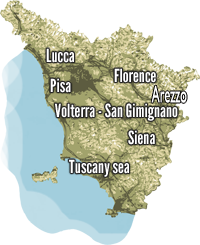 Shops and restaurants Pomarance 2 km, Volterra 20 km are available upon request barbecue and washing service. Possibility to rent a mountain bike. Horse riding 2 Km Pets Allowed. Recommended for outdoor vacations. P1065-1 Monolocale (2+2 people), 40 m2 : living room with sofa bed and kitchen, mezzanine with double bed, 1 bathroom. Balcony with table and chairs. P1065- Bilocale ( 2+2people ) 40 m2 : living room with kitchen, 1 double bedroom, 1 bathroom. Balcony with table and chairs. P1065 Trilocale A ( 4+2 people) 60 m2 : Living room with sofa bed and kitchen, 1 double bedroom, 1 twin bedroom, 1 bathroom, outdoor area with table and chairs. Price include: towels and linen for bathroom, bedroom and kitchen, utilities, swimming pool 12mx6m Hmin 1,6m Hmax 2m (mid may – mid september), final clenaing, towels weekly change. The apartments are all in Tuscan style, with simple furnishings and essential. The complex has a large garden of about 10,000 sqm, swimming pool (12×6 m, open from May to September), tennis court (concrete), common room with fireplace and air toys. The pool is surrounded by garden and a forest of oak trees with tables and chairs, where cool down on hot summer days. Shops and restaurants Pomarance 2 km, Volterra 20 km are available upon request barbecue and washing service. Possibility to rent a mountain bike. Horse riding 2 Km Pets Allowed. Recommended for outdoor vacations.